High Tech Computer (HTC) gave its latest smartphone a name it can live up to, Tattoo, because people who buy it will be invited to design their own personal skin for the phone. Announced Tuesday, the HTC Tattoo is the company’s fourth smartphone to use Google’s Android mobile operating system and the second Android handset to use HTC Sense, the company’s own user interface. The interface is designed to let people create their own home pages with the most important data up front, whether a quick link to Facebook, contact lists or more, plus additional screens for different aspects of life such as work, play and family. The 3G (third generation mobile telecommunications) smartphone sports a 2.8-inch touchscreen, 3.2-megapixel camera, digital compass, FM radio, 3.5mm audio jack and MicroSD card slot to add more storage capacity to the 512MB on board. Aside from 3G mobile phone signals, the handset works with Wi-Fi 802.11b/g wireless and Bluetooth. The smartphone will be available in Europe at the beginning of October and then roll out in other markets around the world in following months, HTC said in a statement. Price information was not immediately available. HTC created the fist-ever smartphone to work with Google’s Android mobile software, the HTC Dream, also known as T-Mobile’s G1. Google designed Android as a mobile phone OS to keep people connected to the Internet and Google services including Google Maps and Gmail. 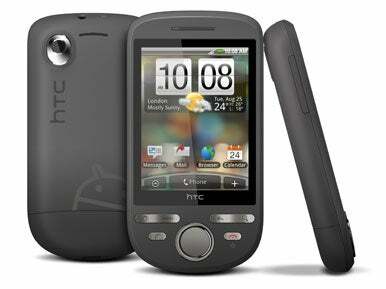 HTC is also the world’s largest developer of smartphones that use the Microsoft Windows Mobile OS.